Originally published in the Yellow Springs News on Feb. 16, 2018. By most estimates, not a whole lot of good can come from a species of trees being almost entirely wiped out by a ravaging insect. The emerald ash borer, a beetle, did just that — the shiny green bugs have made their way across the United States since 2002, making their homes in ash trees and essentially suffocating them until they die. Yellow Springs was no stranger to the ash borer invasion, and aside from a few trees near Ellis Pond that have been treated against the borer, most ash trees in the village are dead. The only upside to this morbid phenomenon was the preponderance of ash wood that became available as the dead trees were cut down before they could collapse. A local arborist named Bob Moore tried to make the most of this unfortunate situation. He founded the Heartwood Lumber Reclamation Project in 2012 and began collecting and milling the wood with the help of a number of locals interested in putting the wood to use. Part of Moore’s goal with the project was to somehow use the wood for the benefit of the community. Moore donated some of the wood to the Yellow Springs school district’s makerspace, which kindergarteners used to make a “buddy bench” outside of Mills Lawn. He had a backlog of wood and wanted to donate it to another public space, and so he recently began looking for somewhere else where the wood could be put to use. 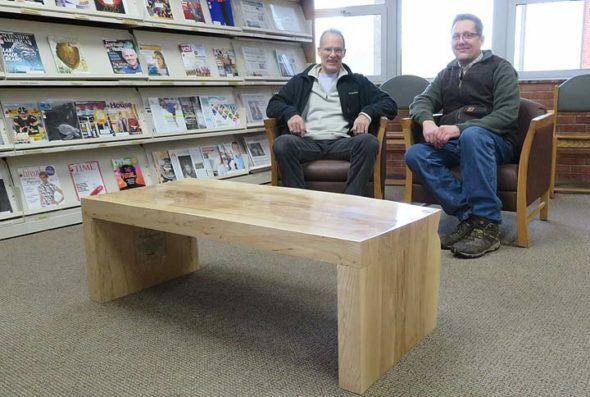 Thus the Yellow Springs library came to be the most recent recipient of the labors of both the ash borer and the local Heartwood Lumber Restoration Project, as wood from a felled ash tree was used to make a new table for its periodical room. Specifically, the wood is from an ash tree previously located on the grounds of the Antioch School. Yellow Springs head librarian Connie Collett explained that Moore approached her about donating something to the library, and she suggested a new piece of furniture. Moore commissioned local woodworker Tom Hawley to construct the table. The boards Hawley was given were approximately three inches thick by about 27 inches wide. The large scale and obvious “crotching” patterns of the wood were qualities that Hawley deliberately emphasized when designing the table. “Crotching” refers to where branches branch off a tree. When a tree is turned into lumber, these patterns are evident on the boards. Urban trees tend to have more crotching, Hawley said, as the branching happens lower to the ground. According to Hawley, wood from ash trees is characterized by its clear color and its “shimmering” quality, though as a fairly hard wood, it is most often used to make the legs of furniture and not typically the tops. In fact, the hardness of the wood lends itself to one of ash wood’s most common uses, as ash wood is often used to make baseball bats, he said. While the hardness of the wood posed one woodworking challenge, the warped nature of the boards posed another. Hawley built the table with massive dovetail joints and couldn’t use standard square or angle gauges to measure the wood. But Hawley was able to overcome the quirks of the wood and complete the oversized joints in the way that he was envisioning. The finished joints are tight-fitting, interlocking angles that are approximately six times larger than those one might find in other pieces of furniture. The unconventional boards “made it more challenging and fun for me,” Hawley said. A woodworker by trade, Hawley has recently switched over to a new water-based finish, which was also used on the library’s table. The finish is not only less harmful to the environment but is also “less stinky” than more traditional finishes, Hawley said, which allowed him to work on the project in the comfort of his home when it was too cold to be in his woodshop. The finish was actually developed in response to California’s stricter laws on the manufacture of motor vehicles, he said. The table took Hawley about three weeks to complete, but he noted that the time frame was significantly longer than it would have normally taken, as he was in the process of reorganizing his shop when he got to work on the project. The table was delivered to the library on Jan. 13. On a recent morning, it sat in the sunlight streaming in through the glass walls of the periodical room, with a chess set on top and a sign indicating the provenance of the wood. Collett said that Hawley had modestly included this information in a place that was hard for patrons to see, and so she made a bigger sign to highlight who had made the table and where the wood came from. The emerald ash borer continues on its rampage across the country. The quarantine on transporting ash wood in Ohio has been lifted, but hundreds of millions of trees have already been killed according to the USDA Forest Service, and the insect continues to radiate in an expanding circle across the country, not unlike a “disease vector,” Moore noted. The insect larvae eat the inner bark of the trees and prevent the transport of water and nutrients. Moore said that one indicator of the fallout from the borer is the fact that the baseball bat industry is on the verge of a crisis as ash trees become less common. In Yellow Springs, it was sad to see the great, big trees go, Hawley said. Some trees in John Bryan were four feet across, and so many were removed that “it looked like a bomb went off” in what used to be a heavily wooded area, he said. But the removal was a necessary step, as the trees are dangerous to leave standing once they are dead. The heavy trees are weakened by the internal decay and pose a threat of falling on people or houses. Collett noted that an ash tree just outside the library will likely have to come down soon as well, as it too has long since died. Hawley left an indicator of the invasive species intact as part of the table’s design: one edge of the table remains unfinished, showing borer trails and the D-shaped holes that indicate their presence. There are also patterns caused by other insects, which are attracted to the pheromones given off by the tree once it is dead, Moore explained. The beautiful patterns belie the destruction that can be caused by creatures no more than half an inch long. To that end, the table is not only a classy piece of furniture but an educational tool that speaks for the tragedy afflicting landscapes all across North America, he said. While most ash trees are now in the “firewood stage,” as Moore put it, there is ample lumber to use as the trees hopefully make a recovery.